Just three Mondays until Christmas… but who’s counting?! And y’all, the star of today’s show, this cozy peplum tee, would make a perfect Christmas present for any lady on your list, including yourself! I say this with authority, as I caught my sister trying to slip it into her bag over Thanksgiving. There are so many things to love about this little thing. The material is so soft and cozy, which in my book is an absolute must for winter weather. Plus, while the peplum detail adds a sweet dose of feminine charm, the fit is relaxed and incredibly comfortable, making it easy to dress both up and down! Finally, the colors are beautiful. Even though I already have it in this pretty lavendar shade, I’m hoping it ends up in grey and ivory in my closet as well. To sweeten the deal even further, I’m so excited to let y’all know that it’s currently 30% off… making it under $50! So scurry along and grab this cutie before it’s gone. For size reference, I’m in an XS! Adorable look! Love the top. That shirt is gorgeous! I love the peplum! I love this peplum shirt it is so cute! So cute! 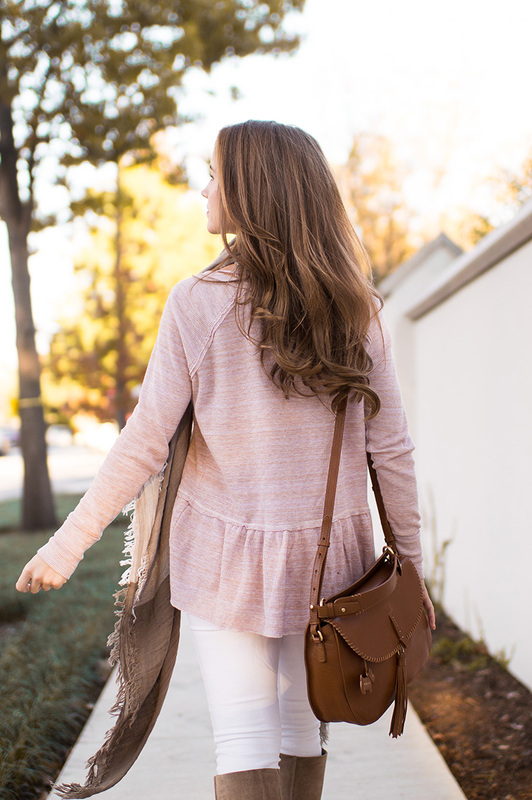 Your peplum is such a pretty color and looks so comfy! Loving this look and that peplum top is adorable! I’ve been loving peplum tops lately and need to get my hands on some soon! I love how its a thermal and a peplum! The peplum totally makes it wayyy cuter! What a great casual top! Love it.